Well folks, we’ve finally arrived at the long-anticipated future of brain-implantable chips. How many hundreds of science fiction novels have led us to this moment? No matter: the chips are here, and we’re getting a good look at ‘em today thanks to a study just out in Nature. Now, before you start panicking about government mind control, know that these chips were built with a benevolent purpose: helping doctors to monitor patients who recently suffered traumatic brain injury or underwent brain surgery. 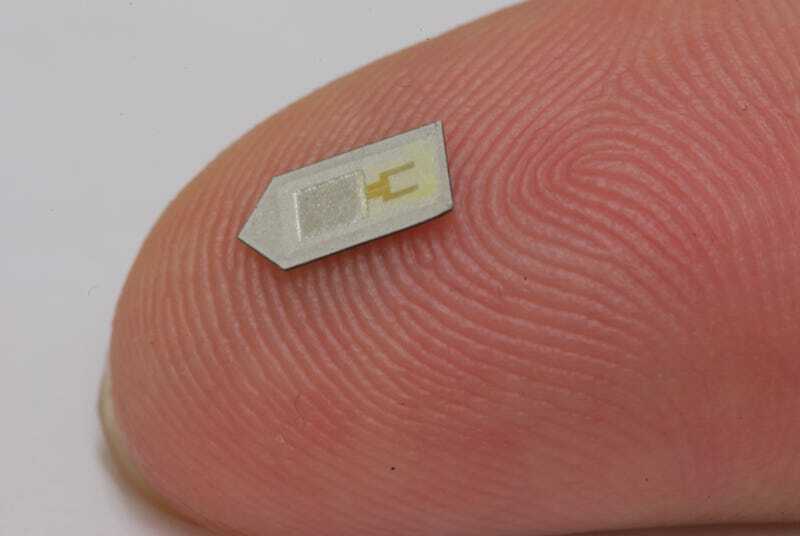 Smaller than a grain of rice, the chip pictured here is composed of thin, biodegradable silicon sheets. For several weeks after implantation, it floats around inside your skull taking continuous measurements of swelling, intracranial pressure and temperature. All the while, it’s being slowly dissolved by cerebrospinal fluid, until eventually, all of those juicy silicon atoms are resorbed by your body. Convenient! In the new Nature paper, engineers at the University of Illinois tested the performance of the chip in rats, and found that it’s comparable to modern brain-monitoring technology—bulky equipment that requires hard-wired access to the head. The team is hopeful their technology will offer doctors a far less invasive brain-monitoring tool; one that reduces the risk of post-surgery infection. Eventually, they say, the sensor might be modified for monitoring deep brain tissue, or for different organs entirely. So, it’s probably time to start saying goodbye to your silicon-free body, if you haven’t already. Chips are coming, and they’re here to stay.